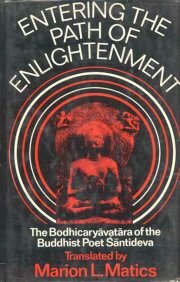 Entering the Path of Enlightenment contains the first complete English translation of the Sanskrit Bodhicaryavatara of the Buddhist poet Santideva. In this beautiful and moving classic of Mahayana Buddhism, Santideva, a monk living in Nalanda in the early eighth century A.D., describes the Bodhisattva Vow, the promise of heroic beings to strive for Nirvana, but to postpone full entrance into the Realm of the Absolute until every other sentient creature also attains the bliss of Enlightenment. This classic of Mahayana Buddhism has often been compared to both the Dhammapada of Hinayana Buddhism and The limitation of Christ by Thomas a Kempis.For the sake of the student and layman as well as the specialist and scholar, the book is divided into three parts: a guide, the translation, and the appendices. The guide, which comprises more than half the book, explains and interprets the Bodhicaryavatara, placing it in the framework of developing Buddhist thought, and discusses the rise of Madhyamika Buddhism, of which Santideva was a disciple. The appendices contain abbreviations used in the text; notes and references for the guide and the translation; a bibliography of primary and secondary sources; and an extensive glossary of selected terms from the guide and the translation. MARION L. MATICS has a Ph.D. in the History and Philosophy of Religion from Columbia University. He is a lay member of Labsum Shedrub Ling, the Lamaist Buddhist Monastery of America, and a member of the Buddhist Society of London, the American Oriental Society, and the American Academy of Religion. Bibliographic Information: 318p. Abbrev., Append., Biblio., Gloss., Notes, Ref.